I’m using Noto Sans in System Settings->Fonts and in GNOME Application Style (GTK). However, The default font of the system is not Noto Sans, It is Bitsream Vera which is very ugly. Is it a problem or is there a fix for that ? Firefox for example uses Bitstream Vera by default instead of Noto Sans. Hi I hope I’ve understood correctly … the font settings in System Settings are Noto Sans but the system is using Bitstream Vera? I once had a weird issue changing widget style and icon sets (don’t remember changing fonts though) wasn’t working when using LightDM as the DM. Changing to use SDDM fixed it. SDDM is recommended for KDE anyways, so doing this may fix the issue you have with fonts. I have no idea of the root cause, and frankly didn’t think it worth investigating further. Changing the Mouse Acceleration Profile in KDE Settings does nothing, do you want to see xorg.0.log ? @mekschr If changing to SDDM fixed the fonts issue then please mark this topic solved and open a new topic with Mouse Acceleration Profile in KDE in the title. but I hope you will agree that doing so would make searching the forum easier and is more likely draw contributions from forum members who know about that particular topic. That said, I think the log is potentially useful, but at the moment I’m unqualified to say anything on mouse acceleration profiles. 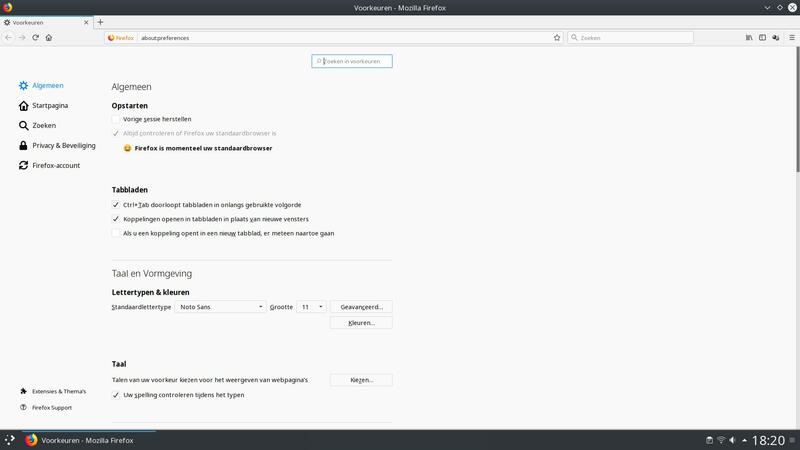 Could you also show a screenshot of the KDE setting? I’ve tried to reproduce your settings, but Firefox took the default font from the system settings. I even tried it with Lightdm, but no problem there. The only thing I had set before was that anti-alias was enabled, disabling it didn’t change Firefox behaviour, it still took the same font from system settings. @Bryanpwo Is there a solution then ? I’m looking into it, hold on. I can’t seem to find anything on it, at first glance. I have to go now, maybe somebody else knows the answer and if not, I’ll get back to you later in the day. Have you tried it with other fonts, just to see if it isn’t the noto fonts that are causing the problem? Hmm… I don’t normally use Firefox, so fired it up and sure enough in preferences it has Default font Bitstream Vera 16 pt. So am puzzled, googled and found this https://askubuntu.com/questions/1069613/firefox-only-uses-its-default-font-cant-use-any-others but the descriptions there do not match my Antergos setup. Your initial post implies that apps besides Firefox use Bitstream Vera, can you confirm that is the case? I’m confused too, like I wrote before, I couldn’t reproduce your problem in my system. seems like firefox chooses the font you see when you type fc-match serif in console, can you tell me the output you get ? andif it is noto sans, can you try changing the font in kde settings to something else like dejavu then restart firefox and see which font is it using ? The strange thing is that the terminal says it’s bitstream vera, but no matter what I choose in the KDE settings, in the Firefox settings the fonts changes to the font corresponding to the KDE settings. But can you name other apps that has that problem, like @BlaiseD alrady asked? Okay to make the confusion bigger, I’ve checked it on my Gnome set up and the default font is Arial (fc-match). This makes no sense at all, why two totally different fonts between KDE and Gnome for the same app?